A Summer Birthday Celebration. Semifreddo with Lemon and Yuzu-shu. Pavlova on the Side. Tonight we are having an early family celebration. For our son’s birthday. It’s hot and humid so for dessert I’m making semifreddo. Light, luscious and creamy. Perfect for a hot summer’s evening. 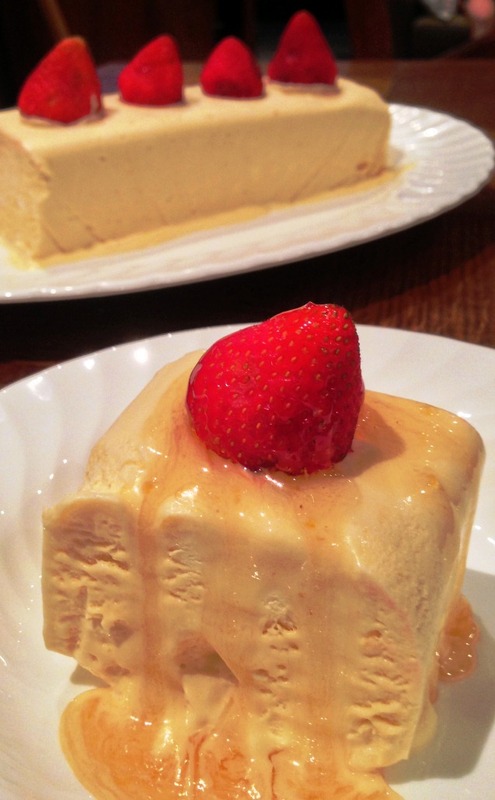 Semifreddo means half -cold in Italian. It encompasses a variety of chilled or half-frozen desserts including custard and ice-cream. Folding in whipped cream gives it a light texture. It’s simplicity is in the making. No ice cream maker or churning required. Once you master how to make semifreddo, you can use whatever flavour or textures you like to make it your own. It’s a very adaptable dessert. With that in mind I decided to open my precious bottle of yuzu-shu (yuzu sake) and incorporate this delicious liqueur into one of my favourite lemon semifreddo recipes. The result was stunning. Lemon, yuzu-shu and cream. A match made in heaven. If you can’t source yuzu-shu, substitute gin or vodka. Or even better limoncello. Now there’s a thought. Yuzu-shu may well be the Japanese citron equivalent of limoncello. Tangy and zesty with mandarin, tangerine and lime notes. My semifreddo recipe uses 8 egg yolks! What to do with the whites? A pavlova of course. Dominica’s recipe. Topped with mango and passionfruit. Two birthday desserts. Needless to say son was deliriously happy. BOIL the sugar, lemon zest and juice with 40 ml yuzu-shu or vodka in a saucepan over medium-high heat for 8-10 minutes until it reaches 110°C on a sugar thermometer or until syrupy. USING an electric mixer, beat the egg yolks for 5-6 minutes until light and creamy. With the motor still running pour sugar syrup into the yolks. Whisk for 8-10 minutes until cool. IN a separate bowl whip the cream to soft peaks, then fold into the lemon syrup mixture until well combined. POUR the mixture into 8 x 150 ml lightly greased dariole moulds, or a 1 litre capacity terrine pan lined with enough plastic wrap to leave a generous amount of overhang. COVER and freeze for at least 4 hours but preferably overnight. PLACE all ingredients in a pan and bring to the boil over medium high heat. SIMMER for 5 minutes until slightly thickened, then allow to cool completely. DIP bases of dariole moulds in warm water for a few seconds, then turn out onto serving plates. POUR cooled syrup over semifreddo and serve immediately. 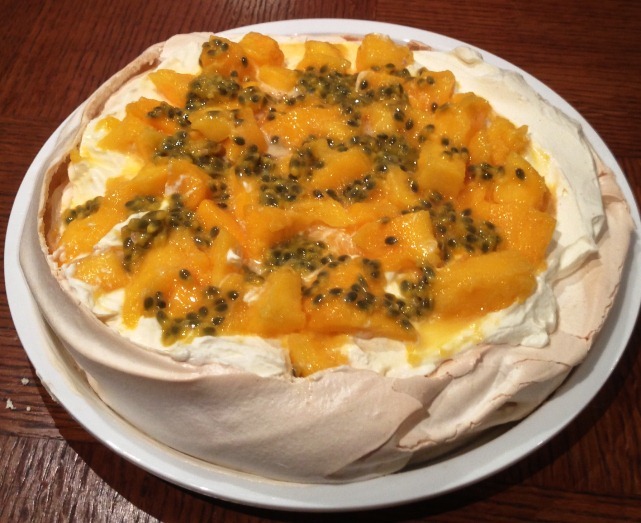 This entry was posted in Frozen, Fruit, Sweet Treats, What I Love to Cook and tagged Gin, Gluten free, Italian, Lemon, Pavlova, Semifreddo, Summer, Vodka, Yuzu-shu. Bookmark the permalink. 4 Responses to A Summer Birthday Celebration. Semifreddo with Lemon and Yuzu-shu. 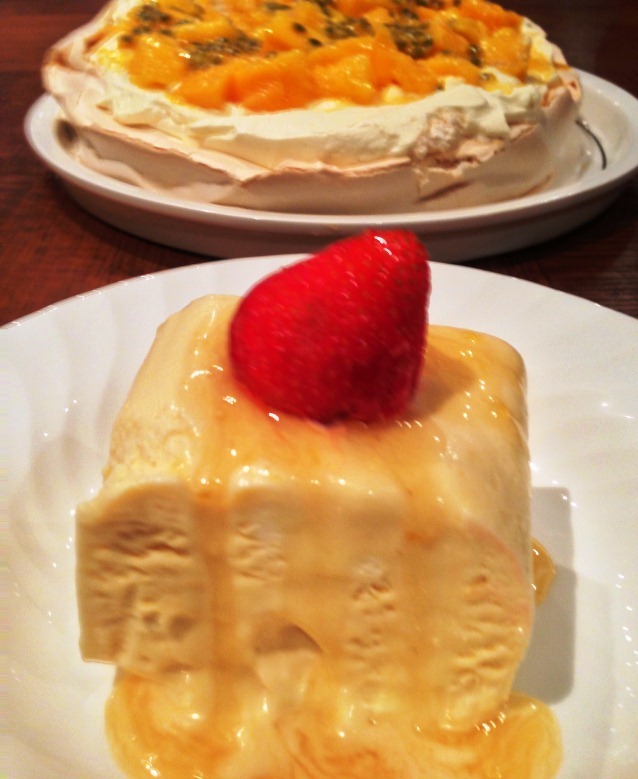 Pavlova on the Side. With eight eggs this one was particularly soft and marshmallow-y inside. I can’t believe both desserts were entirely demolished. The upside? No beckoning left overs. Hi! Your semifreddo recipe was nominated as one of the “Best 300 Semifreddo Recipes on the Net”. To vote for it, please visit http://easyitalianrecipes.org/dessert-recipes/best-300-italian-semifreddo-recipes-on-the-net-vote-for-your-favorite/ – your recipe is positioned at #92 (random order).